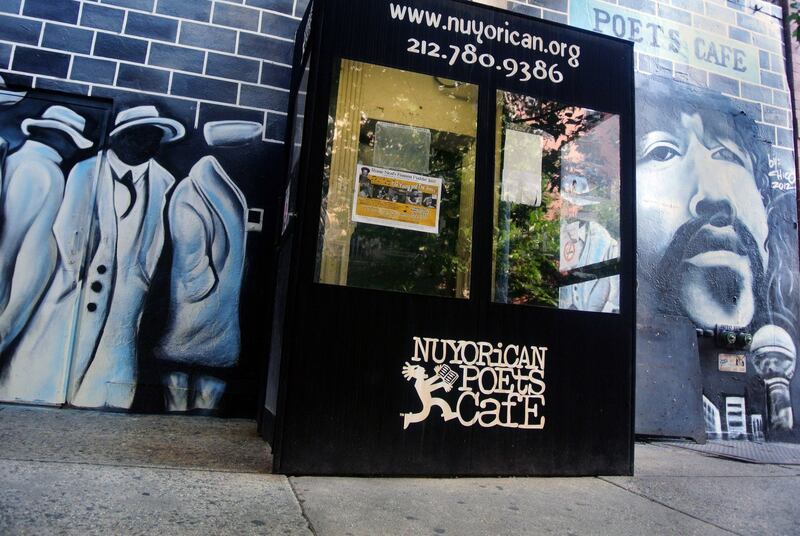 Nuyorican Poets Cafe conducts two weekly Poetry Slams at their Cafe. Winners are chosen strictly by audience members. Audience judges are not required to have any previous experience. The winner of their Wednesday night Poetry Slam is eligible to compete in their Friday Night Slam. If you win the Friday Night Slam, you are eligible to compete in one of the five Semi-Final Poetry Slams that happen throughout the season. If you win the Semi-Final Slam, you will become one of Nuyorican Poets Cafe poets to compete in their yearly Grand Slam Finale which gives you the chance to qualify to be on their National Team. Spotlight Poets are featured before the Slam each Friday Night and are curated by the Nuyorican SlamMaster. Open Mic Mondays (Every Monday) Doors open at 9pm. Tickets are $8 at the door. Play us a song, show us your stand-up, read us a poem, perform in any genre you want! You get five minutes to show us one piece: Stun us, impress us, and make it count. So get down, sign up, and show us what you got! The first 25 people to sign up are allowed 5 minutes on stage to perform. There is then a 5-slot waiting list for any extra time at the end of the show. Artists must bring their own music and props for their performances. The cafe offers a piano that can be used for performance acts. Wednesday Night Slam & Open Mic – Every Wednesday Night except the first Wednesday of the month. Doors Open @9pm: $8 admission. The first 20 poets to sign up will slam & the winner of this night is eligible to perform in the Friday Night Poetry Slam. Get there early & sign the book. The Open Room Every Friday Night after the Poetry Slam: approx. @12:30am The Open Room is a Nuyorican poetic institution that happens right after the Friday Night Poetry Slam. Anyone can read one poem at the mic and every kind of poet and poetry is welcome. There are no judges and no numbers. Hosted by Atrayn. ALL THAT! Poetry, Hip-hop & Jazz Open Mic (Every First Wednesday of the Month) Doors open at 10 pm. Tickets are $13/$10 with Student ID. ALL THAT! Hip Hop Poetry & Jazz night brings emcees, poets, musicians, and artists from a variety of backgrounds together for an open jam session. It’s a time in which all artists can come to discuss and perform openly, and have the opportunity to jam and see such amazing acts as Antonio Hart, Weldon Irvine, Krykah Badu, O.C. and Rahzel as well as many other unknown emcees and performers all on the same stage! ALL THAT: Hip Hop Poetry & Jazz is one of our most diverse events where many people from different backgrounds and musical interests can come together as one and share in their love of poetry and music. RULES: Open Mic participants are allowed to recite One Poem, One Verse, or One Song with the DJ. Participants are not permitted to bring musical accompaniment for performances or request to recite their work acappella. Participants may be asked back on stage to perform another piece, depending on the volume of people signed up and amount of time remaining. Words: Hip-Hop, Poetry & Jazz Open Mic (Every Third Saturday of the Month) Doors open at 9:30 pm. Tickets are $13/$10 with Student ID. Are you a new artist? Are you looking for a chance to spit some bars or perform your poem in front of a crowd? Words: Hip & Poetry Showcase & open Mic is a chance for new artists and poets to come and show their stuff. We encourage young artists from everywhere to take this opportunity to showcase their work, mingle with other artists, and enjoy a live band and DJ. Words is definitely a night at The Nuyorican you won’t want to miss! RULES: Open Mic participants are allowed to recite One Poem, One Verse, or One Song with the DJ and/or live band. Participants are not allowed to bring their own music or request to recite their work acapella. Participants may be asked back on stage to perform another piece depending on the volume of people signed up and amount of time remaining. Urbintel Presents: “Verses” Open Mic (Last Saturday of the Month) Doors open at 10 pm. Tickets are $10. VERSES, hosted by “The Crazy One”, Helena D Lewis happens every last Saturday of each month. It’s a chance for all you poets, both young and old, to come and show your stuff, get a laugh and have a good time. RULES: Participants sign up as the door opens. Partisans are allowed 4 minutes to perform one poem. Participants are not permitted to bring musical accompaniment for performances. The Nuyorican Poets Cafe presents a wide variety of events, produces some events in-house and is sometimes available for rental. For more information about rentals, please call the office at 212.780.9386. We often give new artists the opportunity to debut their work, and are open to booking requests from performers and arts groups of all types. However, we do not have the financial resources to produce, develop, or promote new work consistently. Here are some general facts about how events are programmed at the Cafe: we generally stage 2 events every night. Late-night slots on Wednesday, Thursday and Friday are almost never available, but we often book outside artists for early evening slots (starting at 6 or 7PM on those nights). We prefer to book night-time events that have a running time no shorter than 45 minutes and no longer than two hours. Rental events can sometimes run longer than two hours, as can daytime events. When we book an event with outside artists, we usually charge $10-$15 for tickets and split the gross ticket income with the artists. Artists generally receive between 40 and 60 percent of the gross ticket income, depending on the type of event. We require that outside artists make a deposit in order to secure an event date. This deposit is necessary because if an artist cancels an event at the last minute or does not attract any ticketbuyers, we can lose hundreds of dollars. The amount of the deposit is between $150 and $300 per event, depending on the length of the event. The deposit is refunded to the artist in full if the Nuyo’s share of the ticket income from an event equals or exceeds the amount of the deposit (so if you give us a $200 deposit for an event at which we agree to split the income evenly, you’ll get back the deposit if the event grosses $400 or more; if the event grosses less than $400, you’ll still get your 50/50 cut of the door, but we’ll keep part of the deposit, in order to make sure that we end up with enough money to pay our staff at the end of the night!) We STRONGLY encourage any and all artists who perform at the Nuyo to promote their events to their friends, fans, colleagues and press contacts. The Cafe sends its event listings to a wide mailing list, posts them online and distributes event calendars; however, we ALWAYS find that artists who do their own promotion attract many more spectators than artists who don’t. And we’re more likely to invite artists back who have promoted their events well then those who have depended solely on our promotional efforts. To inquire about booking an event at the Cafe, e-mail info@nuyorican.org. Feel free to include links to a website, online videos or other examples of your work, and please include a brief artist bio. Please do NOT send large attachments. The Nuyorican Poets Cafe offers educational programs for students from junior high through grad school. They conduct writing and performance workshops and their poets perform at schools, theaters, and community venues. We also hold educational events at our East Village venue, and we train teachers to use poetry as an educational tool for their students. For information on how to bring their artists to your school or plan a trip to the Cafe, email info@nuyorican.org.